Indiana University East students and Chancellor Kathy Cruz-Uribe help to prepare bowls for the Empty Bowls event on October 27. The community is invited to Empty Bowls from 11 a.m. to 12:30 p.m. on Wednesday, November 15, in the Student Events and Activities Center on the Indiana University East campus. Empty Bowls is being held in coordination with IU East’s “One Book, Many Voices” project. Guests are invited to select a bowl, made by IU East ceramics students and community potters Scott Shafer, Terry Vance, Brian Haviland, and Lynne Glass. The bowls are then filled with soup and bread. Area restaurants including The Den at IU East, Forest Hills, Hometown Dining Company, McAllister’s Deli, and Reid Health’s Cafe at Twelve Hundred will contribute soups for the event. There is a limit of one bowl per person. The cost per person is $10. Proceeds will benefit the Exodus Refugee Immigration, a humanitarian program that provides protection and opportunity to refugees fleeing persecution and war. Agencies such as Exodus provide services to refugee newcomers from the point of arrival to self-sufficiency. The United States has a long history of welcoming immigrants and refugees. Refugees have built new lives, homes and communities in towns and cities in all 50 states. For more information visit exodusrefugee.org. Carrie Longley, chair of Fine and Performing Arts and assistant professor of Fine Arts, established the program locally in November 2014. 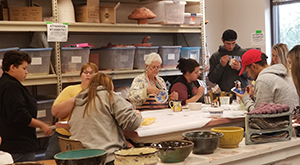 To prepare for Empty Bowls, IU East students in ceramics courses handcraft 250 ceramic bowls for participants to choose from and purchase at the event. Area artists also donated bowls. Empty Bowls is sponsored by the IU East School of Humanities and Social Sciences. Throughout the day, the community is invited to participate in the events and activities leading up to the evening presentation by Mohja Kahf. Kahf is the author of The Girl in the Tangerine Scarf, this year’s “One Book, Many Voices” selection. Kahf will give a talk via Zoom on Wednesday, November 15. The live video lecture will be shown at 5:30 p.m. in Vivian Hall, located in Whitewater Hall. The event is free and open to the public, but a reservation is required and can be completed online at onebook2017.eventbrite.com. A previously recorded interview with Kahf will also be shown in Vivian Auditorium from 2:30-4 p.m. This event is open to the community as well. IU East ceramics students and community potters create handcrafted bowls. In exchange for a cash donation to benefit Exodus Refugee Immigration, guests select a bowl which will be filled with their choice of delicious soup. Cost is $10. Sponsored by the School of Humanities and Social Sciences. Poetry Workshop and Performance with Syed Umar Warsi. Snacks and recorded author video with Mohja Kahf.